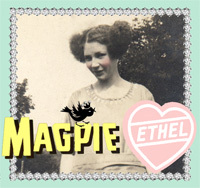 Magpie Ethel: 10 YEARS of Crafty Wonderland Fun! If you have a collection of vintage sunglasses you should wear them! I share a collection each Tuesday. #127 Vintage Halloween Party Books. 10 YEARS of Crafty Wonderland Fun! This weekend is my tenth year as a vendor at Crafty Wonderland. I look forward to this show every year! I have a huge booth and it is so fun to see all my creations come together in one magical world. (you can search Crafty Wonderland on my sidebar for past show photos). Hope to see you there. Come and say howdy! I do holiday events locally at Christmas and will list shows during that season. The rest of the year you can find my creations on Etsy. It Is Almost Holiday Etsy Time! Holiday Magpie Ethel Show Schedule!